Tokyo people Modern Japanese in the northern prefectures have rounder eyes, more body hair and wider faces, which suggests closer links to Jomon people who lived from 10,000 B.C. to 400 B.C.. The archeologist Yasuhiro Okada told the New York Times, "People from northern Japan can be 60 to 80 percent of Jomon origin, while those from western or southern Japan are 40 percent Jomon or less." Regionalism remains strong in Japan. While the writer Patrick Smith was visiting the northern town of Akita, a taxi driver told him that he was not from this area, he was from Osaka. Smith asked when his family moved here. "About 200 years ago," he responded. People from Miyazaki in southern Japan are known for speaking with a particular accent and those from Tohuku in northern Japan are regarded as speaking in a funny peculiar way. People from Nagoya are regarded as cheap and tight. People from Shikoku are regarded somewhat as hicks while those from northern Japan are considered warm, tough and uninhibited (men and women takes baths together up there). 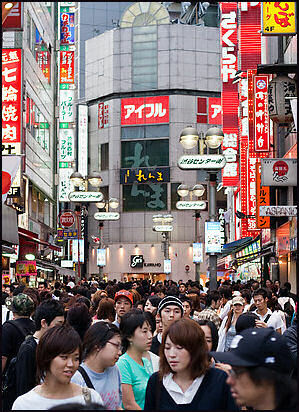 People from Tokyo and Kanto are regarded as busy, cold, impersonal, polite, formal and stressed out. They are less likely to have a desire to stand out and they favor brown, gray and earth-toned colors. Many of the stereotypes that are used to describe Japanese as a whole seem more apt for Tokyoites than Japanese outside of Tokyo. Tokyo is where the samurai class was based in the Edo period and the culture has a long history of obedience, duty and following rules. Tokyoites and Osaka people are the two dominate groups in Japan. Sometimes they have different customs. In Tokyo people stand on the left of escalators and pass on the right. The opposite is true in Osaka. The Tokyo dialect is the standard Japanese heard in news broadcasts and in the Tokyo area. The Kansai dialect is the dominant form in owari bangumi entertainment programs as many comedians and entertainers are from the Kansai and make many jokes in the Kansai dialect. Taro, the symbol of Osaka People from Osaka and Kansai are regarded as more outgoing, pragmatic, independent and irreverent than other Japanese particularly those from Tokyo. They are more likely to jaywalk, gamble, show their feelings, display rude or inconsiderate behavior, smoke in no smoking areas, and show disdain for bureaucracy and rules. Osaka-ban, the Osaka dialect, is regarded as rough and crude by many other Japanese. Kansai people were known as the biggest cowards in World War II. They had a much higher rate of desertion and running away than Japanese from other regions. 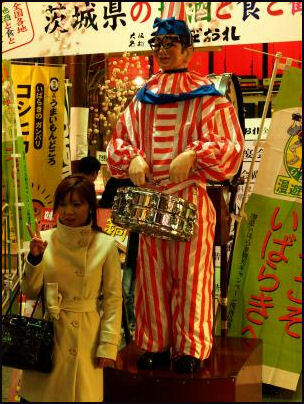 Osakans have been called the “Latins of Japan.” They produce many of Japan’s funniest comedians and are known for enjoying good food, wearing bright clothes, and hating Tokyo and Tokyoites. Their appetite for life is summed up by the local word kuidaore (literally “to eat yourself to bankruptcy”). There is also a more unsavory side to this. Osaka is No. 1 in purse snatching, train molesting and illegally parked cars. When you ask a Tokyoite for directions they point in the direction. When you ask a Kansai person for directions they take you there. It has been said that Osakan friendliness has it roots in the absence of samurai and the presence of a large number of merchants. One Osakan told the Japan Times, "Merchants consider everyone a potential customer. They don't want to run the risk of losing you as a customer so they go out of their way to be friendly." The merchant class of Osaka stays alive in other ways. A common Osakan greeting is "Are you making any money?" Osakans are very stubborn about keeping their dialects even after living years in Tokyo. The Osakan dialect is almost like the Japanese equivalent of cockney English. It is full of colorful expressions and is the source of amusement in many comedy routines. The preferred insult in the Tokyo area is “baka.” It roughly translates to “idiot.” In Osaka the preferred word is “ahoya,” which roughly means “foolish,” as in making mistakes that all people make at one time or another. Osakans are regarded as very impatient. They often say "Time is Money" and say Tokyo people waste a lot of time in meetings. According the one study Osakans walk faster than Tokyo people (1.60 meters per second as opposed to 1.56 meters a second). Osaka was one of the first places to have crosswalks that displayed the number of seconds until the light changes so people know how long they have to wait. When No Car Day was introduced to relieve traffic by asking people not to drive the traffic was actually worse. The thinking among Osakans was that there would be less traffic on those days and would be better for driving, hence everybody drove. at a tea shop Kyoto people have a reputation for being arrogant, cool, mannered, refined and partying a lot. They consider themselves to be the Japanese elite. The Kyoto dialect is so formal it is almost like the Japanese equivalent of Shakespearean English. Kyotoites have a reputation for being conservative, valuing tradition, admiring quality over profit and going out their way to avoid conflict and develop harmonious relations. Introductions, connections and secrets are necessary to get ahead in Kyoto’s social world. 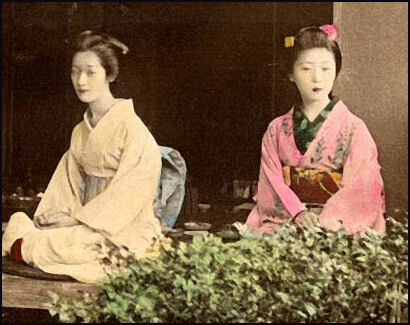 The relocation of the royal family to Tokyo in the 19th century is still regarded as a tragedy. Kyoto is where old traditions remain most intact. The Geisha world still exists and people still follow arcane rules of etiquettes that were dropped centuries ago in the rest of Japan. People from southern Kyushu and Okinawa have a reputation of being big drinkers and partiers. Okinawans are the longest-living people in the world. People from Kyushu and known for their grit, perseverance and toughness and were regarded as among the best fighters in World War II. In the 1960's a group of Kyushu farmers tired of being portrayed as bumpkins and fed with government restrictions dug up their rice fields are rallied around the battle cry: "Plant plums and chestnuts, and to Hawaii we will go!" The Okinawans are regarded as warm, friendly, fun-loving people. They are considered somewhat eccentric by other Japanese. When one Okinawan man was asked by National Geographic reporter Arthur Zich what the difference between Japanese and Okinawans were, the man said, "The heart. Ninjo”human feeling. Up there it's cold. In Okinawa it's warm! Like our sun!"